My former roommate and friend Adrienne emailed me yesterday. Adrienne and I lived together over the summer of 2003, and I knew right away that we’d be fast friends after our long discussion about our fascination with weird number combinations. (As in, how cool is tomorrow’s date? 11-11-11! That’s awesome!) Since we don’t live near each other now, I love getting Adrienne’s emails… they don’t come often, but when they do, they are awesome and ask my opinion. What flattery! Adrienne’s question yesterday was about Pinterest, what I think of it, and how exactly it works. I think this is a pretty common question because you either get it or you don’t… kind of like Twitter. It definitely took me a few visits to Pinterest to get all the kinks figured out, but the general concept is really smart. I have enjoyed using it as a cataloging service more than anything. After I wrote out my thoughts about Pinterest to Adrienne last night, I figured it was worth sharing with you too, just in case you’ve been considering it but maybe are a little intimidated or overwhelmed. You can categorize your books into groups, or what Pinterest calls categories. (I have categories for JD, food, baby things for Maggie, hair styles, house ideas, etc.) Much like sections in a bookstore, you put all your books in the right places for quick reference later. When visiting your library/Pinterest, you can choose to see your friends’ books in a random order, or look individually at your friends’ book groups. In order to see your Facebook friends’ books, you have to “follow” them. Or, you can look at everyone on Pinterest’s books in their library, in real-time. If you like other people’s books, you can repin it and add it into your collection. You can also “like” and comment on other people’s books, even though you don’t have to add it to your collection. As for my use of Pinterest, I utilize it to get ideas on DIY projects, possible blog posts, style combinations, and recipes. It’s a neat concept, and the obsessive-compulsive part of me really appreciates how orderly it can be. Also, even though I frequent my Google Reader more, Pinterest is much more organized than my Google Reader’s favorites where I “star” posts that I like. I wish I could categorize my Reader like I do on Pinterest, since I visit my Reader three times more often than Pinterest. I have found that I can become completely absorbed in Pinterest, and I’ve lost track of time… in a big way. Much like all other fun things online, Pinterest can be a complete thief of my time, and sometimes I get so absorbed, I don’t know how to get out! 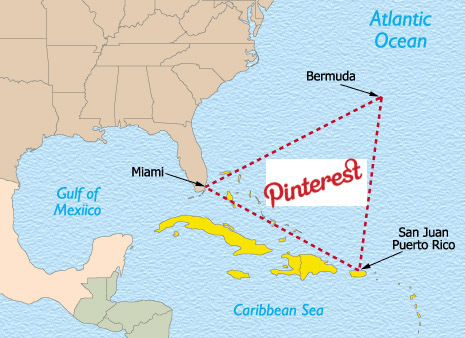 Pinterest… the online Bermuda Triangle! Are you still confused? What other things about Pinterest do you have questions about? I wanted to simplify it as much as possible, and I know other people use it in different ways. If you do use it, how?